On Saturday at Kinnernet, the last session I attended before leaving was led by an Israeli guy named Uri Baruchin who asserted that something had changed in the blogosphere, and we were starting to have a problem because a meme (my word, not his, and it's what I called it as I disagreed in the session) would not spread so fast in the blogosphere now that A-list bloggers were waning in link counts (a popularity scale because it uses a single digital social gesture, the link, and does not weigh at all the many other conversational gestures of a blog over time -- that would require multiple digital social gestures and a much more complex "algorithm" than just counting links). He was worried that the number of smaller discussions required to spread news would make the blogosphere as a whole less effective in broadcasting news, and somehow this meant there was some loss of power bloggers had been holding and was now waning. I disagreed with his thesis, and gave some obvious statistics but also some ideas. First, I said that the blogosphere's purpose was not singular. This goes for both individual bloggers and on the whole, if there can be a "unified purpose," which I don't think there is because there are too many different kinds of blogging. Remember blogs are tools, and each person takes it and uses it in whatever way makes sense, which probably means there are 33+ million slightly different to extremely different variations of blogs now. Anyway, back to disagreeing with the "unified purpose" idea. 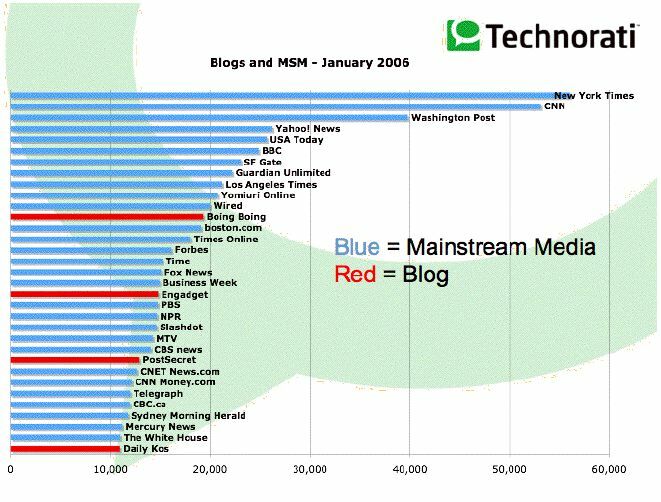 So, if you look at this from one view -- through the State of the Blogosphere reports put forth a in October 2004, where counts for the NY Times and MSNBC were in the neighborhood of 17 or 18 thousand links, and top 100 bloggers like Boing Boing and Instapundit had 6 or so thousand links. At that point in time, Technorati tracked 4 million blogs and 400 million links, and now, a year and a half later, Technroati tracks 33+ million blogs and 2.2 billion links. In January, 2006, the NY Times has 55,000+ links and CNN has around 53,000+ but Boing Boing has 18,000+ and Instapundit has 5,600 links (the are no longer the number 2 blog, as that position is now held by Engadget at 15,600+ links) you can see that while the blogosphere has grown 7x and the links 5.5x, the inbound link counts of the top blogs and media has grown 3x. Also, take into account that Technorati changed its methods of link counting last August, after several things occurred (Robert Scoble complained about its link counts in comparison to Bloglines which counts every link since it started counting, and I had reported on how link counting worked across 5 services and then other's reports of frustration with the Top 100 and A-list counts where sparce posters' links were favored over frequent posters' links). So Technorati changed from counting just links on the top pages of a blog (those posts that linked but dropped off the front pages were dropped from link counts) to any link that had occurred in the past 6 months. Technorati still counts one link only per blog, no matter it's location on the blog posts or blogroll, no matter how many links come from one blog, but all link types age out after 6 months. So these statistics for the later time frame are different and not exactly comparable, but let's do it for the sake of argument here. So, what does this mean? Well, since there are 5.5 times more links in this 1.5 year time frame, I believe it means that there are more links made to non-A-list bloggers than bloggers further down the power law curve about , that are in what I call the "conversation middle of the power law curve" (the curve for specifically link counts), than those A-listers at the top are receiving. It means to me that while a year and a half ago, when I explained the conversational middle to people like Peter Hirshberg and Francis Piscani and thought it was far more interesting than what most people were discussing then (the top of the power law, or the existence of the power law curve at all), that now there is some evidence that as the blogosphere goes main stream, it is moving more to the middle, at least as link counts go, to more personal conversations rather than pointers to a few top media sites or the blogs that are act more like broadcasters. The broadcast model for links in blogs means that many more links went to a top blog, than they were able to link back to, because it was just physically impossible. 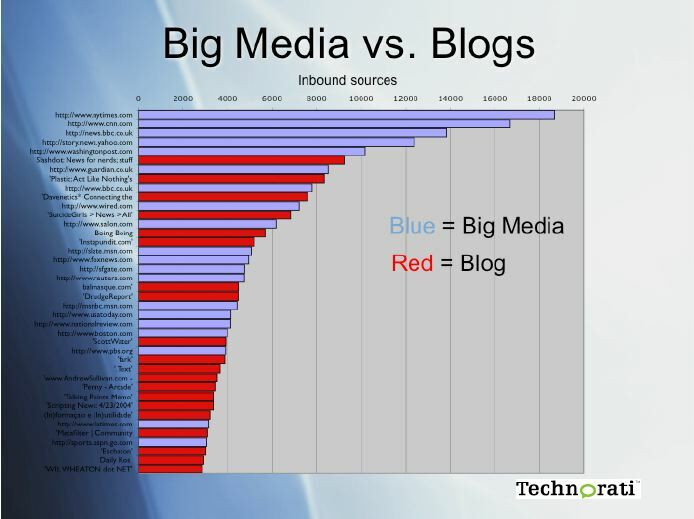 Those top bloggers are 1-to-thousands in their distribution, and yet for inbound links counts, they have thousands of inbound links as opposed to far fewer outbound links to others. But the conversational middle, then, and now, is both say, 12-to-12 for distribution and receiving links, or 50-to-50, or for larger blogs, maybe 500-to-200, depending on the size of the conversation verses those listening and linking back. And now the mainstreaming of the blogosphere supports this hypothesis more. The top of the power law curve has been referred to as the A-list, and certainly last summer, when Blogher discussions erupted at the last and well packed session of the day, and so many women expressed extreme anger and frustration at Technorati's link counting methods and particularly the there was a lot of interest in figuring out ways to reveal topic communities lower down that power law curve. At Blogher, I suggested we work on something that would show not just a few bloggers in topic areas that were at the top, but rather sift the entire blogosphere, using as many as 22 different metrics, though some are not currently available but tool builders were welcome to build some of these out, to show "conversationalness" and "influence over time" instead of the "popularity" of link counts as the Top 100 or Top 500 that was subsequently built by Feedster, currently shows. Lots of people responded with lots of interesting ideas on the subject of how to approach this. A system like this could more accurately reveal the conversational middle, to make it much easier for more than just the participants in smaller communities of say 50, to find and expose their interests and conversations. This would also, for some of the women at Blogher, make them feel more validated or exposed as leaders in their topic areas (not politics or tech stuff), or if that was not their interest, make the Top 100 less validating and congratulatory of those who by virtue of being on the list seemed dominant, which clearly was their desire. 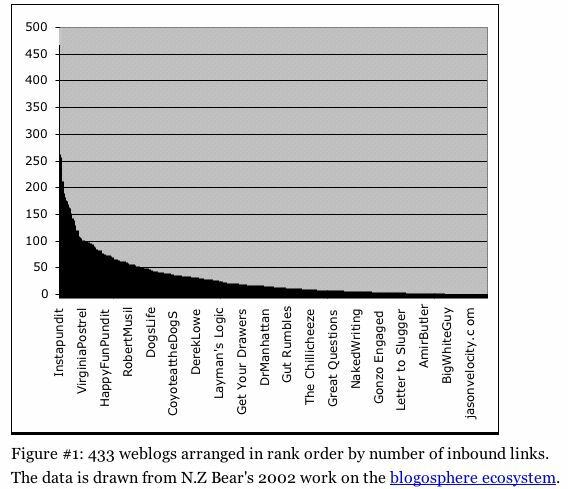 The idea that bloggers are not passing memes as effectively because there is less influence by broadcast style bloggers, even though more small conversations are experiencing more links going blogger-to-blogger, further down the power law curve, is silly. If people are genuinely interested in something, and have something to say, they'll blog it. These conversations occurring in the middle pass and discuss memes just as before, but the linking and diffusion of the conversation is evidence of a more mature, and interesting use of the internet, not less so. And now, if a meme crosses lots of blogs in the blogosphere, I believe it's a sign of far more interest by people, than under the earlier broadcast mode of meme spreading in the older, more early adopter blogosphere. And this certainly isn't a problem. The internet as a medium is more supportive of spread, edge conversation, than the amassing of top down broadcast distribution. The act of blogging is the act of subverting old broadcast methods of communication. The maturing of the blogosphere with less broadcast distribution and more conversation between people spread far and wide is a welcome and more democratic way of bringing together people who want to discuss like interests. Certainly there are still bloggers who are more highly read with more inbound links that resemble broadcasters in some ways, and who PR people will continue to try to manipulate, but still, there is a shift to conversation with more symmetric linking, and that is positive overall. Our next challenge now is how to see how small conversational communities and the attendant tools that sift these conversations can use more than one or two digital gestures, and create topic awareness of blogger groups with more than just the early adopter or blog-tool favoring metrics that post categories or tag indicators do now. 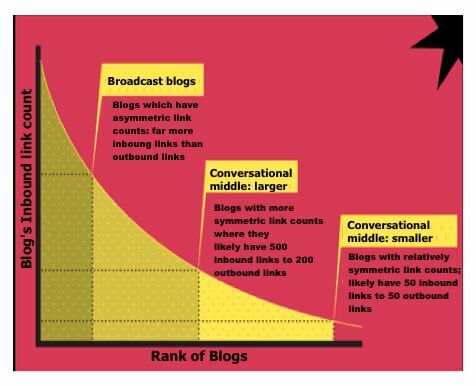 These metrics too are subject to power law curves and the current uses of them one or two at at time only reflect top bloggers, or early adopters, just as link counts did before, emphasizing them over the conversational middle. When the tools of exposure change, the conversational middle will become accessible and apparent not just to those in and around a particular conversation but to those outside it. That "Israeli Guy" has a name. Thanks for this post and for the thoughtfull comments in my chat. I'm still playing travel catch-up at work but hope to post a summary of the discussion soon. Thanks Uri.. I changed it above to put in your name!